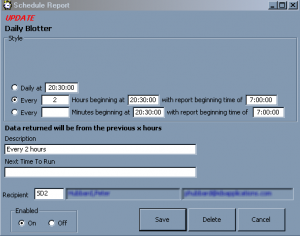 Scheduled Reports is the latest feature added to Lawman Reports module. The Daily Blotter report is now capable of being set on a schedule to be e-mailed to a group or just a single recipient. It allows users to schedule reports to be sent daily, every x hours, or even every x minutes. Are you an administrator and want to see your department’s activity on your mobile device without having to be tied to your desk? This is the perfect solution for you. What if your off to a conference or training session hours away, this allows you to stay close to your department while being far away. Another feature added at the request of a client! Prerequisite indexes are necessary to be installed in your local database.